Each Ink Dupe issue will feature the layout below. Working on Tomoe River paper, I’ll swatch the ink with a damp paintbrush, then various nibs (fountain pen and dip), and I’ll do a chromatography strip. If you’re interested in seeing the tools I’m working with, let me know and I’ll write a short post on them. I don’t plan to provide a write up for each image, just my overall thoughts on the comparison. If neither ink has sheen or shimmer, I’ll just scan the page. If either ink does have sheen or shimmer, I’ll take a couple of photos to show those. I doubt they’ll show up in a scan. I’ll only scan the chromatography strips. I won’t adjust colors in any way from the scan. I will, however, likely move sections of the scan in Photoshop to better align the various samples. Keep in mind that there’s no way to guarantee the colors will appear true-to-life on your screen. However, both colors will be “equally distorted” for lack of a better way to put it. 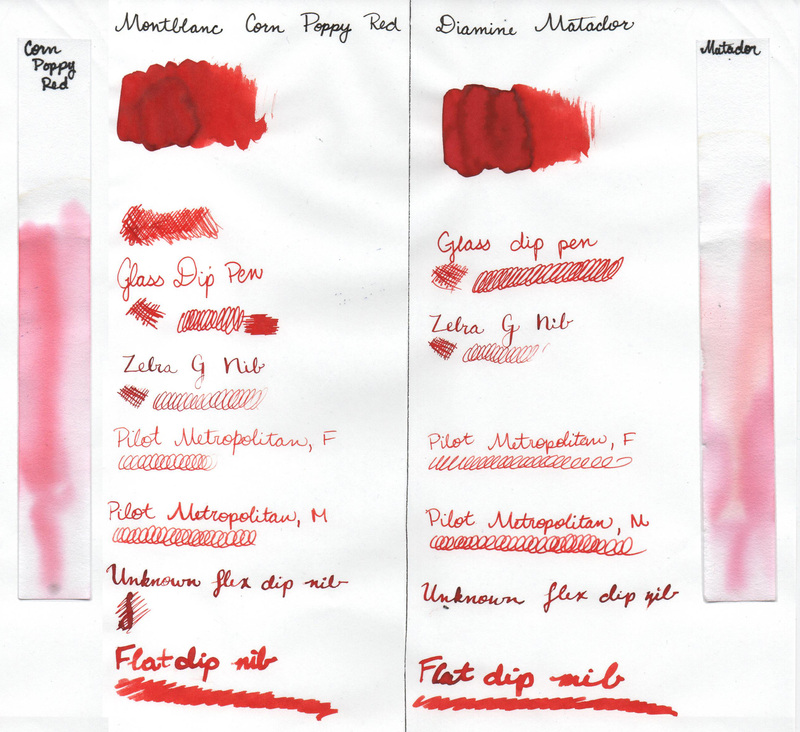 My goal is to show you how the ink colors compare as best as possible. This series isn’t about performance. You can find numerous ink reviews for that. 🙂 Now, enough blabber, time for the good stuff. Keeping in mind that I’m not an ink or pigment expert, I’m surprised that Matador is the more complex color when it comes to chromatography. I would expect the more expensive ink to be more complex.